I’m not a big fan of the Lebanese way of serving turkey. It’s like the regular Sunday lunch Riz A’a Djej (rice with chicken and fried nuts) but with a turkey instead. Last year’s feast included 2 turkeys since mom and I spent the whole day in the kitchen to cater for the extended family dinner. I manhandled a turkey, giving it a butter massage while mom had her turkey deboned and wrapped and tied with seasoning and aromatic vegetables inside. We also prepared bread stuffing and my roasted vegetables as sides and a pumpkin pie as dessert. This year I’m thinking of something different. I still haven’t decided. For now, I’m thinking of sides as finger food. I found an old recipe I prepared and kept aside. 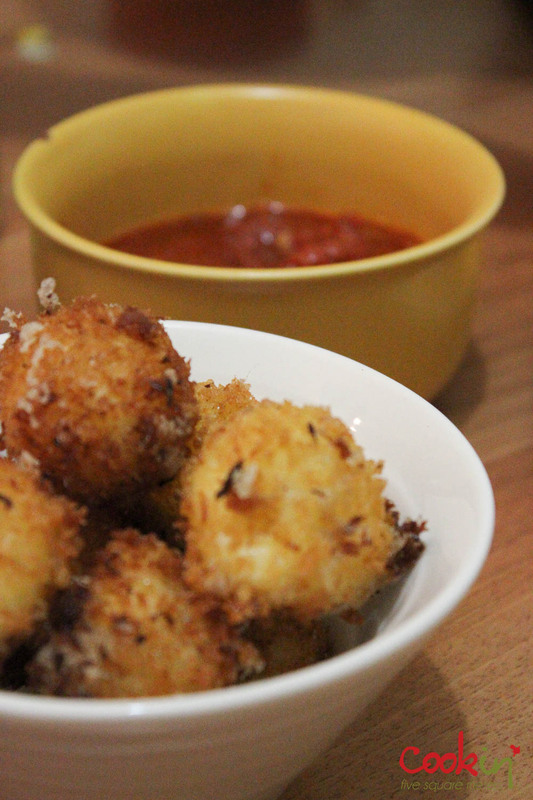 It’s easy, delicious and can be prepared way ahead of time to be cooked on the spot; Mozzarella balls with marinara dip. 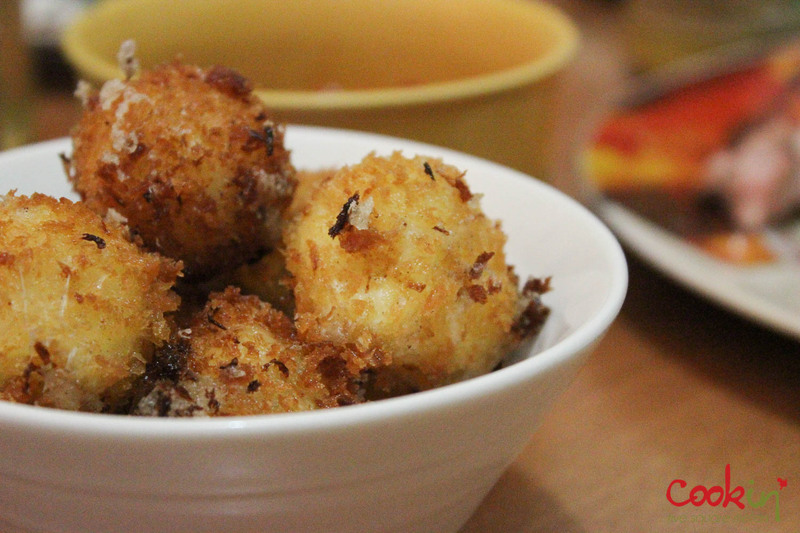 These gooey balls of fresh cheese are a suitable side for any occasion. Their crunchy shells contrast the soft interior and give enough texture to hold the dip for a complete flavor. You need to prepare this recipe at least an hour before cooking to give the cheese enough time to freeze and maintain itself through frying time. Go ahead and make them now then stack them in the freezer for quick party fix. Prepare a simple marinara sauce and keep it in the refrigerator as well till serving time. The only downside is that they have to be served freshly fried and hot. 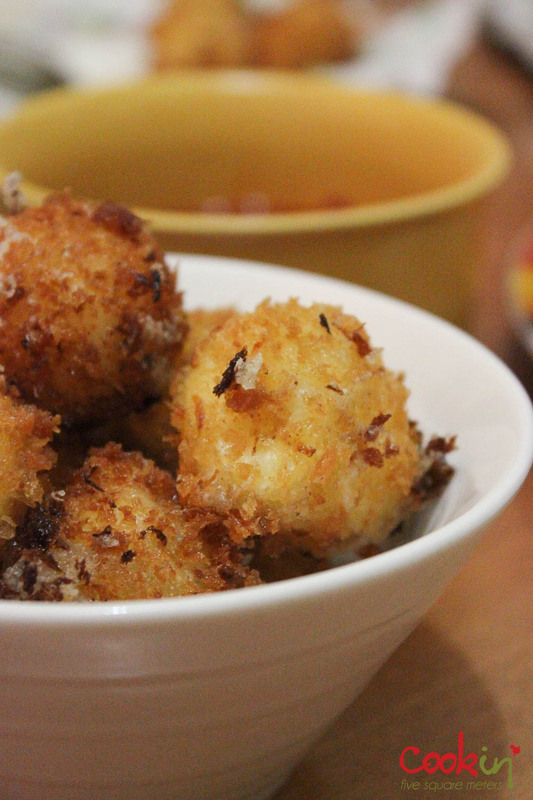 This entry was posted in Christmas Recipes Dec. 2014, Dinner, holidays, Recipe and tagged appetizer, balls, cheeese balls, cheese, cheese balls, deep fried, dip, finger, finger food, food, fry, marinara, mozarella, panko, party, party food, Sauce. Bookmark the permalink. This is my idea of food heaven!